Google Services: Google Office go on: JotSpot Googled ! Google Office go on: JotSpot Googled ! Google go on developping their new "Google Office": JotSpot is part of Google today . JotSpot was founded in 2004 to provide an application wiki which is "a private website designed for collaboration. Unlike a traditional website where pages can only be read, in a wiki everyone can edit, update and append pages with new information, all without knowing HTML." The startup is based on creating and sharing documents, spreadsheets, photos, and other files, that's why JotSpot is interesting for Google on their way to develop a new software offer online. 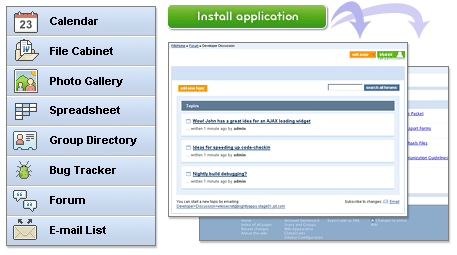 New account registrations is closed while JotSpot is now moving to Google's software architecture.